More than 200 Healthy Exchanges® recipes for healthy, tasty, and easy dishes--all made using a food processor. Today's food processing machines are more versatile, affordable, and easier to use than ever before. 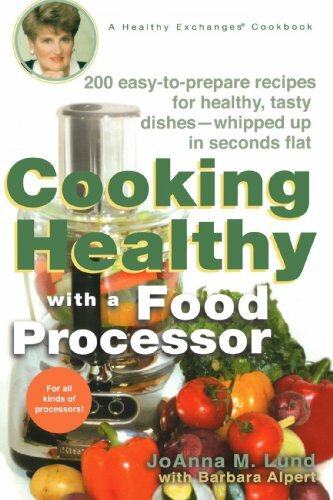 And now is the time for readers to discover--or rediscover--the healthy goodness and time-saving convenience of their food processors. Even the cook who's all thumbs can easily whip up soups (such as Easy French Onion Soup), vegetables (such as Dilled Potato Vegetable Bake), main dishes (Pork-Tenders-and-Potato-Bake)--even desserts (Aloha Carrot Cake or Cheyanne's Peach Crumb Pie). The book also features step-by-step instructions for any kind of food processor; easy-to-find ingredients; complete nutritional analysis and diabetic exchanges for every recipe; JoAnna's Top Ten Tips for getting the most out of your food processor, and lots of advice for stocking the pantry.